This Wednesday, an affordable housing development in the the Bronx designed by COOKFOX Architects will hold its long-anticipated ribbon-cutting. The developments are dubbed Park House and Webster Residence, the former house containing 248 units and opening this week, the latter containing an additional 170 units and opening in 2018. Both are intended for low-income and formerly homeless households. The complex was topped off in May of last year. The complex has been built on what was formerly a vacant industrial plot. Its facade is set in a combination of brick tones, stratified and layered to produce a “biomimetic surface reminiscent of ocean sand or tree bark patterns,” as the firm writes. The 12-story buildings also incorporate sustainable design techniques, utilizing green roofs, natural light, recessed green spaces, and a central garden and courtyard shared by tenants. As the firm’s founding principal told AN last year, the materials and layout of the complex are meant to instill “a sense of permanence, a sense of belonging to the streetscape” – a motivation which seems especially apt when designing for the recently homeless. The project was completed through a partnership between COOKFOX Architects and the nonprofit Breaking Ground (formerly Common Ground), the city’s largest housing provider for the homeless. 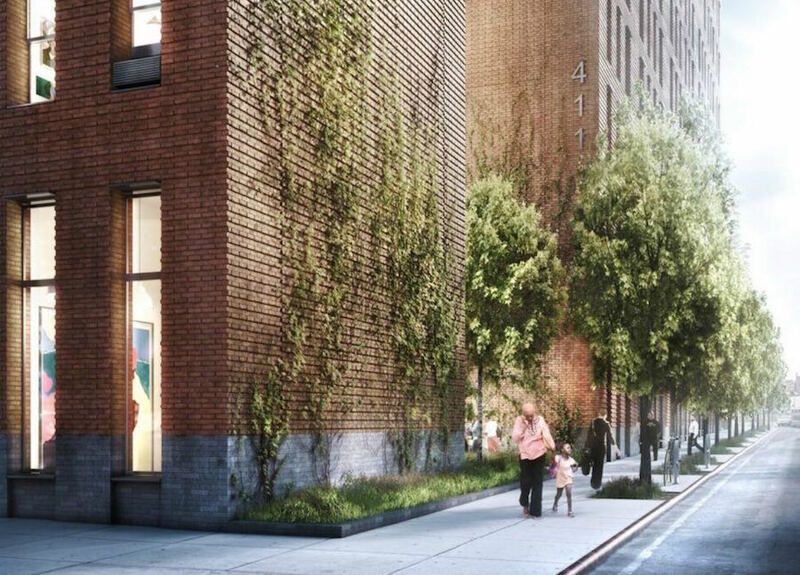 Breaking Ground currently manages over 3,500 units of supportive and affordable housing largely within the New York metropolitan area, and have set a goal of building an additional 1,500 units for low-income and homeless families within the next five years – no small task. But with three more residences already planned in the Bronx, their target is well within reach.